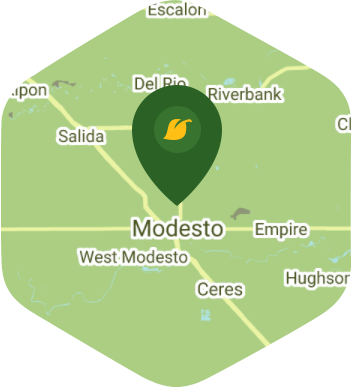 Book a skilled lawn pro in Modesto. Backed by a total satisfaction guarantee and amazing customer support. Looking for the best lawn care services in Modesto, California? Lawn Love brings lawn care into the 21st century. It's never been easier to get affordable, quality lawn care with a push of a button. Get an instant quote for lawn care services near you such as lawn aeration, lawn mowing, leaf removal, gutter cleaning, gardening, yard care, weed control and more. See why we're rated the #1 lawn care service company in the Modesto, CA area. Book now, read our reviews, and see for yourself. Who would have thought that a small town that was a humble stop on the railroad between Sacramento and Los Angeles would turn into the bustling center of culture and arts that Modesto is today? Living in Modesto provides you with so many opportunities to experience and see new things, whether it's a tour of wine country or a weekend getaway to Yosemite, you probably don't have time for a lot of other things – things like lawn care. Sacrificing your free time for the care and maintenance of your lawn isn't something you have to do, not when Lawn Love is here to help. Lawn Love is a fully insured and bonded lawn care company. Our teams of highly skilled, experienced, and friendly lawn care technicians want to work with you to create the lawn you've always wanted but may not have the time for. We can take care of all your lawn maintenance, from mowing and trimming to seeding and weeding, all you have to do is give us a call to get started. To find out more about Lawn Love's free, fast and easy two-minute quote, just give us a call today at 209-353-8304! Knew exactly what was needed and did an outstanding job. Thank you. Will use this pro again! I appreciated that he edged around the "difficult" areas. The best I have ever had!!! Thanks for coming on such a hot day. Juan did a good job on Friday. I am quite happy with the service, so far. Rated 4.67 / 5 stars in 48 Modesto customer reviews. There won't be any rain in Modesto today, which means you'll probably have to water your lawn. Dusk and dawn are the best times to water your lawn (the sun will rise at 6:17 AM and set at 7:47 PM today in Modesto). Here are some average lawn care prices for homes in Modesto. Average lawn size 2,997 sq. ft.